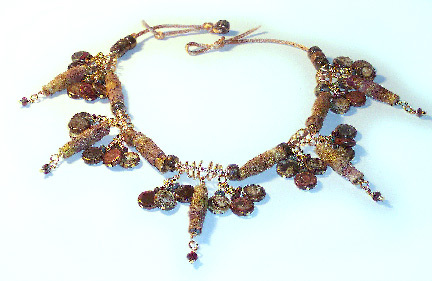 Last week, I showed you how to make the fabric and the wire beads for this necklace. Today we're going to finish it up! See the post at the link above for the materials and tools list and for the first half of the tutorial. 6. Cut 5 pieces of 20 gauge wire into 5 inch lengths. Slide a fabric bead on each and create a wrapped loop at both the top and bottom, filing smooth. 7. 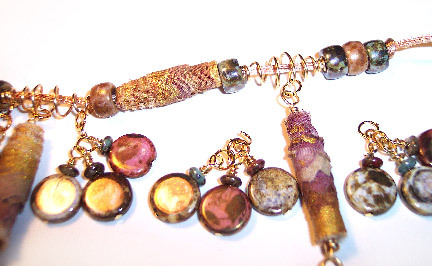 Attach each fabric bead to the middle of a wire bead using a jump ring. Create small clusters of ceramic beads as follows: *Place a lentil bead and a small rondelle on a head pin and close with a wrapped loop. Make 3 of these. Attach 2 to a jump ring. Open another jump ring and attach it to the first jump ring and the third wired bead. Open a third jump ring and attach it to the second jump ring and to the end loop of one of the wire beads. Repeat from * until you have 10 clusters, one at each end of the 5 wire beads. 8. On 5 head pins, place a 2mm metal round and a small rondelle. 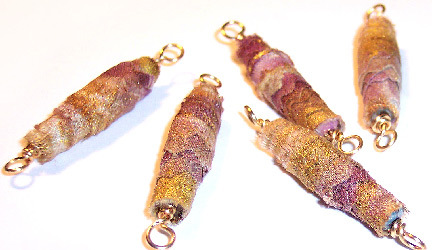 Close with a wrapped loop, and attach each to the bottom of a fabric bead with a jump ring. String a bead on one end and slide it to about 3 or 4 inches from the end. Tie a knot to anchor the bead in place. On the other end, create a loop, big enough to slip over the bead, and tie a knot. Use fray check on the ends. Copyright 2013 Cyndi Lavin. All rights reserved. Not to be reprinted, resold, or redistributed for profit. May be printed out for personal use or distributed electronically provided that entire file, including this notice, remains intact. Lovely necklace . Thanks for sharing such a lovely tutorial ! Now my fabric scraps can be put to a very unique use !